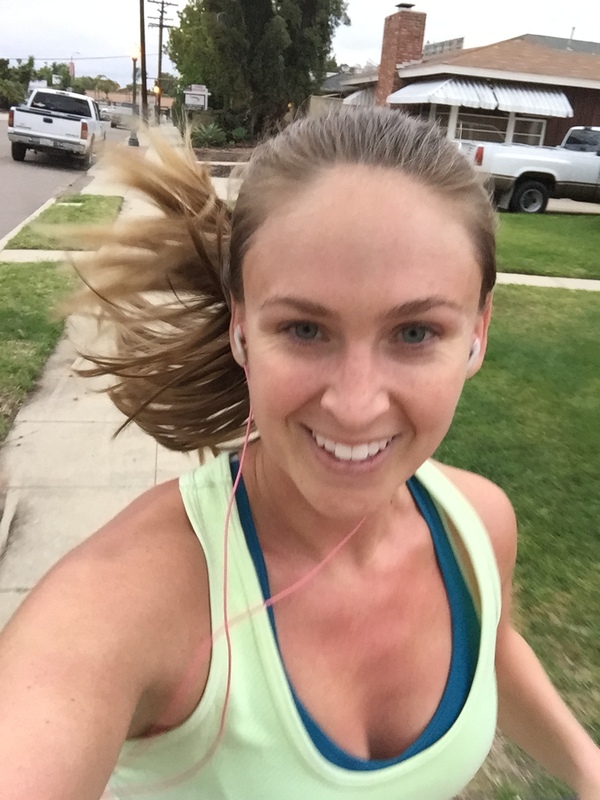 In honor of National Running Day (June 7th), I’m bringing back an OG post from the early days! Here are my best beginner tips for becoming a runner. The first time I attempted to run an entire mile on the treadmill it took me twelve minutes. Slow by “runner” standards, but I was stoked to be able to say, “I can run.” For a while I went through a real running stretch, hitting the pavement every day and getting up to 7 mile runs. Alas, my body is not built for running (literally, my podiatrist said, “Your body is not built for running”), and I have been battling injuries ever since. Today I’m limited to 12-15 miles a week, but now I run 9 minute miles, not 12. This is why I love triathlon- the cross training has made me a stronger, faster runner. Unlike swimming and biking, running isn’t a mystery. You need a good pair of shoes and the will to keep moving. It’s so simple, but so hard. Be sure to wear gear you can be seen in- reflectors are always a good idea, and light clothing if you’re running at dawn or dusk helps you stick out. Be sure to wear your sunscreen and sunglasses to protect your eyes. If you’re running on roads with cars, run on the left side of the road, facing traffic. Let’s face it- drivers aren’t always paying attention, so you need to see them before they see you. I like to carry my cell phone in case I need help (it’s also my GPS run tracker and music machine). You should also always carry some form of ID and contact info with you, even if you’re just going on a short run. Write it on a card to stick in your pocket or shoe, write it on your hat, or make it obvious on your cell phone by putting ICE (In Case of Emergency) in the name of your emergency contact. I love my RoadID ($19.99, roadid.com), a small rubber bracelet with a metal plate that lists my name, date of birth, and emergency contact information. If something bad happens while I’m out running and I’m unable to communicate, the emergency personnel can find what they need to contact my husband or mom on my RoadID. The health of your body begins at your feet. Seriously. If you run in poor shoes, you will suffer and do damage to your body. I am a deal hunter and a bit of a cheapskate, but when it comes to my running shoes I do not sacrifice. Take the time to visit your local running store and have a foot and gait analysis done. Plan to spend at least $100 on a good pair of running shoes. Trust me, you will make up for it in all the podiatrist’s bills you don’t have. I speak from experience. Running takes practice. Building distance takes time. If you’re not a runner, please do not expect to head out the door with your new $100 shoes on your feet and run four miles. Heck, don’t expect to run a mile. You have to build up your distance. There are plenty of apps that provide Couch to 5k programs, but I am a fan of the walk one run one method- You walk a minute, then you run a minute. Switch on and off for 20 minutes. When you get the hang of that, try it for 30 minutes. When the running feels easier, switch to running 2 minutes and walking a minute. When that’s easy, go to 3 minutes running, 1 walking, and so on. Build gradually, and before you know it you’ll be running an entire mile without stopping. When you get to that point, you can start building your distance gradually by adding length to your runs, being sure to increase your mileage no more than 10% each week. There are so many ways and places to train! You can run on a treadmill, on a track, on the road, on the trails, or on the beach. Each has its own advantages and disadvantages. You may start on a treadmill if you want to control your speed and just get started. You may try a track if you want to gauge your distance without an app. You may choose the road for its convenience and similarity to race conditions. You might choose sand or trail for the scenery and added challenge to your leg stability. Any way you slice it, you just have to get out there and start running. Try different terrains and see what works best for you. The only word of caution here is to be sure not to do all of your running on a treadmill. It may not seem like it, but running on a treadmill is easier than running outside. The belt is always moving, which means you don’t have to drive quite as hard to push your body forward. So if you’re using a treadmill to get started, be sure to move onto solid ground once you’ve got the hang of things. Thank you, modern technology, for all the ways you track our lives. Runs are no different, with a myriad of apps to help you plot, track, and motivate your runs. Personally, I’m a fan of both the MapMyRun and Nike Run apps. They keep tabs on your routes, your distance, your speed, and your pace. They even talk to you mid run to let you know how it’s going. Fair warning- they are addictive, and discovering at the end of your run that you neglected to start your app can leave you feeling like your run never really happened. One safety warning here- if you’re like me and you post your runs to social media or share them with others through the app, be sure not to include any information about run routes that start or end at your home in your posts. Nobody needs to know where you live except the pizza delivery guy. Sign up for a local 5k run race. They’re a dime a dozen nowadays and they give you a goal to train for while also contributing to an awesome cause. Participating in a run race can also help you familiarize yourself with some race basics like picking up your packet ahead of time, waking up early for a 7am start gun, learning how to get your digestive system under control on race morning (again, a post for another week), and my person favorite, learning to be okay with the porta-potty. Seriously, who knew there was so much to learn from participating in a local 5k? This goes for every workout, but you have to get in the habit of stretching after a run. During a workout your muscles contract and tighten, and if you don’t lengthen them back out you’re going to wake up mighty sore the next day and potentially put yourself in jeopardy of injury and long-term performance deficit. So stretch your calves, your buns, your hamstrings. Stretch your hip flexors. Get a lacrosse ball or a golf ball and rub your feet over it for added bliss. It may seem trivial, but taking 5 minutes to stretch at the end of a workout does you a world of good. Have a question about starting your mastery of running? Send me an email at theanxioustriathlete@gmail.com and ask! If I don’t know the answer, I will find out. I’m happy to look like an idiot so that you don’t have to.